Michigan is one of the largest deer-hunting regions in North America, ranking second in the nation in the 2016-2017 deer harvest (Mack, 2017). Hunters are known for having a strong sense of pride in their community and their culture, sometimes integrating hunting into their identity, and there are plenty of communities in which non-hunters are the “odd-ones-out.” Deer hunting season only lasts few weeks out of the year, but the culture lingers year-round through clothing, storytelling, and venison consumption. Hunters must be knowledgeable about registration guidelines, safety, and strategy. Many hunters are initiated into this practice by members of their family, seeing their hunting as an extension of their family lines, a way of upholding tradition. Our objective with this mini ethnography is to give an in-depth view of how hunting affects a modern family’s gender roles, kinship systems, and values. Hunting is an integral part of the Johnsons’ lives, and observing how it affects their relationships as a group through its contributions to their family values and kinship system affords us the opportunity to gain a sense of how hunting interacts with gender relations throughout mid-Michigan. 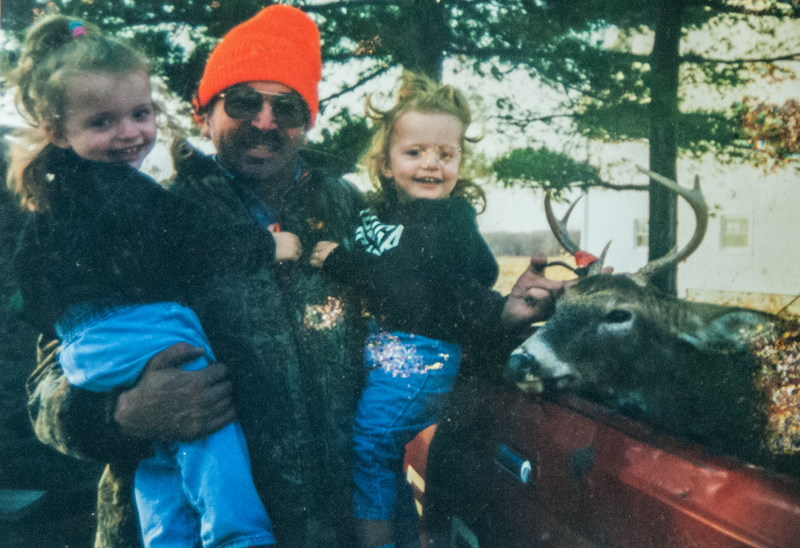 The families of mid-Michigan keep the time-honored practice of deer hunting alive, and the Johnson family is no exception. 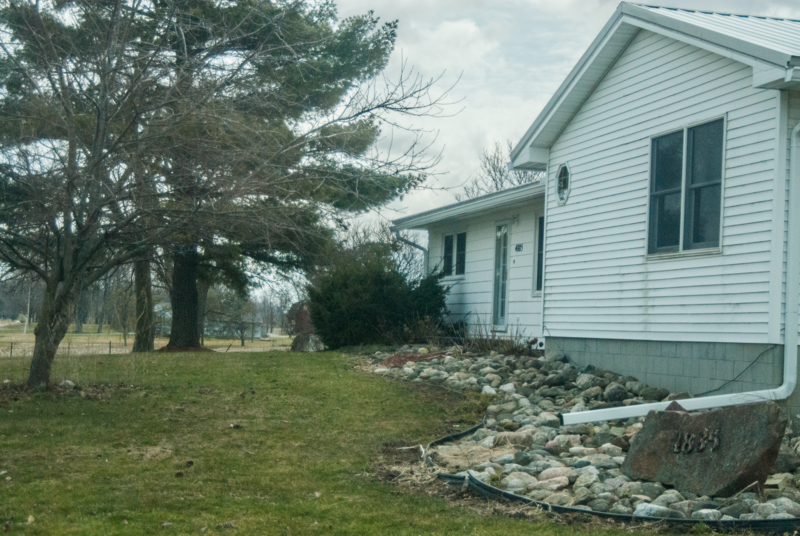 Three generations of the Johnsons live in a mid-Michigan farming town where the family owns and operates their own farm, managing 2,600 acres of farm land. Grandpa and Grandma H. live on the farm in the house where they raised Julia and her brother, who lives down the street with his family, and Julia live just across the road with her husband, Thomas, in the home where they raised their four daughters. Thomas hails from Northern Wisconsin, where most of his family lives close together as well. The Johnson home. Photo by Sarah Horton. The four Johnson daughters do not currently live at home, but they all still reside in Michigan. The eldest daughter lives in a neighboring town where she works as a chef, the second eldest works as a College Advisor on the west end of the lower peninsula and the two youngest, the twins, study at a university about an hour away from home. During our visits we had the privilege to speak with the second oldest daughter, Catherine, and the youngest daughter, Sarah. Each member of the family has hunted since a very young age, normally exposed to the practice before the age of ten. Although some of the family members have tried turkey and duck hunting or fishing, the Johnsons primarily hunt deer and different members of the family typically participate in shotgun, bow, and muzzleloader seasons. 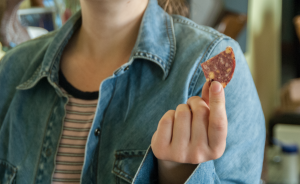 Katie holding a piece of venison sausage. Photo by Sarah Horton. Katie is a close friend of the Johnson family and has known them for several years. She grew up alongside the Johnson daughters and Julia, the mother, often says that she thinks of Katie as one of her own. This previous relationship is what afforded us the opportunity to speak with this family and collect data through three separate visits to their home. 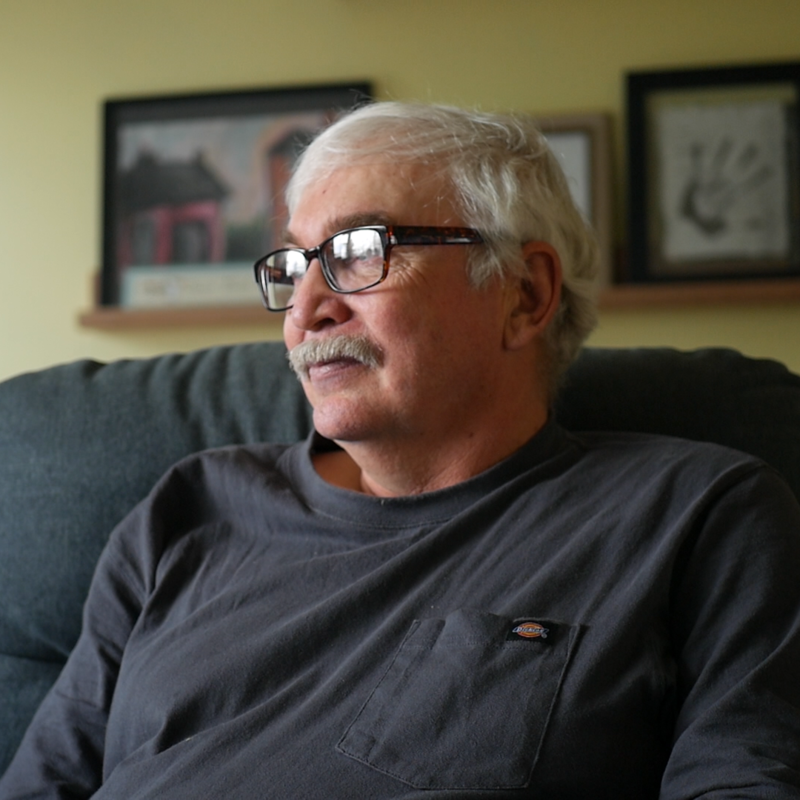 The other members of this research team had not met the Johnson family before, but they come from similar regions in Michigan and share a similar socio-economic background. These commonalities allowed each group member to approach the mini ethnography with a basic working knowledge of deer hunting and its importance in the region. 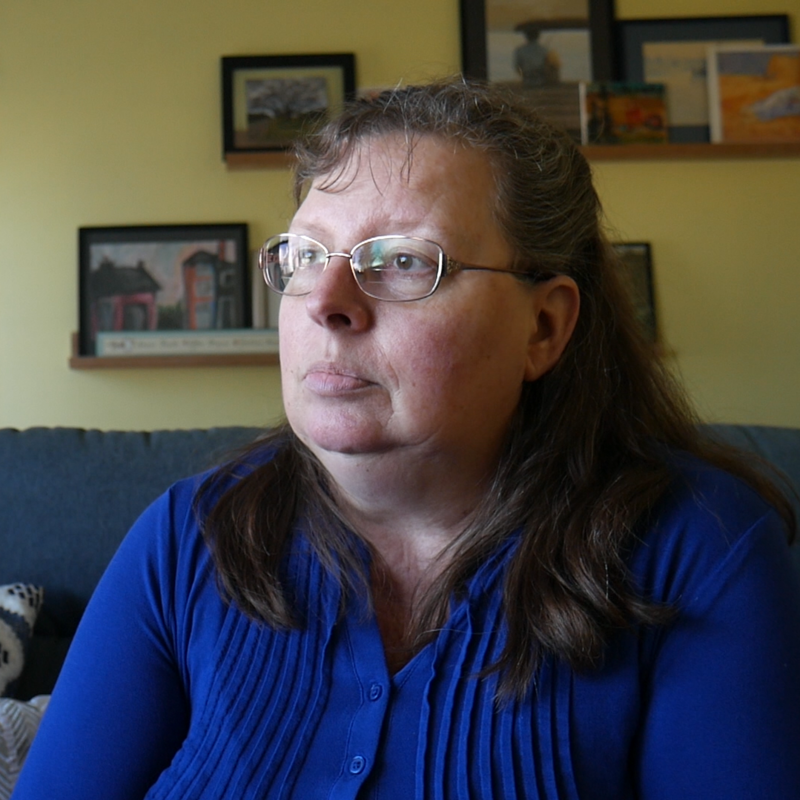 Our research methods included kinship analysis and informal video interviews. We immersed ourselves in the environment by walking around the farm, viewing some of the Johnsons’ rifles, tasting their homemade venison sausage, and observing the family’s collection of deer mounts. Due to the fact that our mini ethnography focuses on hunting within the context of family, we concentrated our questions on this topic, performing basic kinship analysis among family members spanning three generations. We explored the relationships between family members by contrasting their experiences and talking through several family photographs. Katie interviewed each family member and asked about their acquaintance with hunting while Devin operated the video camera and Sarah took pictures and notes. 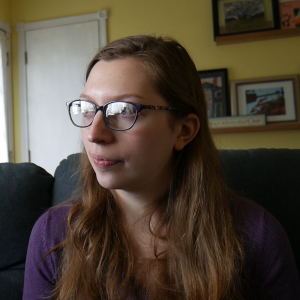 Through our interpretations of literature reviews along with the testimonies of our participants, we will illustrate the ways hunting interacts with one Michigan family’s structures and understandings of gender. Note: While the Johnsons agreed to be photographed, videotaped, and interviewed, they also requested a degree of confidentiality regarding names. In light of today’s social media-driven world, where names and personal information are easily dispersed and searchable, we have chosen to assign pseudonyms throughout the essay. Hunting is commonly portrayed in American culture as a manly pastime, a show of masculine strength and skill, a way to carry on the legacy of forefathers who utilized their masculinity to fend for themselves in new terrain and to build their families on new land. Even so, nearly all of the women in the Johnson family hunt despite cultural expectations that women are less likely to hunt. Upon first glance, this phenomenon appears to represent a changing of the tides. It would be easy to look at how many female hunters come from this family line in the present day and praise the progress society has made. However, generations upon generations of men and women hunted synchronously and their family is not alone in this tradition. Hunting narratives in North America during the early nineteenth century stem from codes of Victorian manhood, crafting and broadcasting “a hegemonic vision of ‘hunter heroes’—survivalists, skilled in woodcraft, armed with sharp-shooting skills and a penchant for adventuring” (Jones, 2012). With this narrative, America retells the story of manifest destiny and masculine conquest as exemplified by icons such as Theodore Roosevelt and Buffalo Bill Cody. This narrative helped lay the foundation the American man: a leader who would advance “the expansionist ambitions of the American nation…while maintaining a gentlemanly moral code.” (Jones, 2012) In the same breath, this narrative depends on feminine subservience to polarize and highlight rugged masculine authorities, clearly excluding women from the band of fierce gun-wielding conquerors. Therefore, in this day and age when cultural understandings of hunting attempt to recreate this American memory of conquering the land, women continue to be overlooked. Although many still depend on imagined biological explanations and longstanding tradition to support male dominance in hunting, anthropologists like Mark Dyble have come to understand that “the earliest human societies are likely to have been founded on enlightened egalitarian principles.” Hannah Delvin writes that Dyble’s study concluded that, even when there is division of labor, “in contemporary hunter-gatherer tribes, men and women tend to have equal influence on where their group lives and who they live with” (Delvin, 2015). Given that our prehistoric forebears exhibited sexual equality, our study has brought a new level of understanding that such equality is not necessarily a new development in modern society and that humans do not inherently assume feminine subservience. Hunting narratives in America have long depended on the notion of male dominance, beginning with adventurers and continuing throughout history, adapting to fit America’s ever-changing identity. The cultural image of hunting underwent one such transformation in the post-war era in mid-twentieth century America. Male-authored sportsmen’s magazines retained control over the discourse on hunting and played a vital role in the restyling of hunting as masculine property. While the earliest American hunting narratives centered around strapping heroes conquering the rugged land to the west, the Post-World War II hunting identity “connected authentic hunting to a new post‐war formulation of masculinity that revolved around militarism and the emotional bonds between men developed through battlefield experiences” (Smalley, 2005). New reconstructions of ideas around hunting’s value have continued to arise throughout American history, but at the heart they have maintained very similar connections to tradition and dominance—whether it be dominance over the wild, over injustice in foreign nations, over women, or any other entities—and have been consistent in dictating who exactly should be hunting and who should not. Humans are not biologically predisposed to assign hunting responsibilities to men and such practice does not originate from any of the mystified ancestral societies that Americans usually cite when explaining the masculinity of hunting. Instead, the masculine portrayal of hunting that you see in today’s American culture is a direct result of labor division practices and romanticized manhood brought to this continent by colonizing Europeans. Women have been hunting and trying to hunt over the course of American history, but male-dominated discourse has continued finding new ways to reform the discourse in order to maintain relevant ways of keeping women in subservient roles to serve as the narrative’s foundation. The former narrative of gun-wielding and hunting as heroic and conquering in the early nineteenth century relied on necessity. With a lack of domesticated animals in the “New World” it was necessary to hunt in order to maintain a sufficient source of sustenance. In twenty-first century America, however, hunting is no longer a necessary source of food for most Americans and deer hunting is not always a dependable source of venison. Even so, deer hunting is an incredibly popular pastime and Michiganders are among some of the biggest fanatics of the practice. Through talking with the Johnson family we see that, while hunting can still be an excellent source of food, hunting retains much of the sport and pride seen in the hunter heroes of the westward expansion era. Presently, both the sport and the sustenance of deer hunting attracts every member of the Johnson family, but they each understand the balance of the two in unique ways. While members of the Johnson family might see hunting as a predominantly individual activity, many of the processes associated with hunting are shared experiences. The family group in particular is an “important socializing agent” as it emphasizes exclusive kinship ties that can further instill value to hunting. (Littlefield, 17). In the introductory stage, the process of learning to hunt is an educational and collaborative event that lays the groundwork for gaining hunting skills and conceptualizing the values that hunting represents. Each member of the Johnson family learned to hunt through social interaction. Sarah (left) and her sister April (right) accompanied by their their father Thomas (center) on a hunting trip. Photo provided by Johnson family. The overarching sense of competition within the Johnson family is another way by which hunting retains a family-centric component. Littlefield cites the “competitive and hierarchical display[s]” of hunting as a method of negotiating concepts of masculinity (Littlefield, 70). The competitive components of hunting give family members a way to gauge their skills in relation to each other and vie for positions of respect. “It’s always fun to see who’s going to get the bigger deer,” said Julia. Each family member we interviewed said that “bragging rights” factored in to deer hunting. At the same time, once a family member has acquired a good catch, he or she can give other family members tips about what hunting spots or methods to try. “It’s not all, “Gee, I want all the glory’,” said Julia. “It’s like, ‘Hey, I saw one over here and I’ve already got one. Why don’t you go over here so you can get it’.” In this way, the family competes with each other, but retains a sense of collaboration. Thomas said some deer hunters only target the largest bucks and take hunting too seriously. “It gets kind of territorial and stuff, which it doesn’t really have to be,” said Thomas. Within the Johnson family, hunting has been passed down through generations and represents certain values. Thomas said he values hunting for many reasons, including its challenging and disciplined components. Julia and Thomas both said they value hunting as relaxing alone-time. Several of the family members said that hunting is a way to enjoy nature and observe wildlife. Sarah said hunting symbolizes the bond she has with her father and carries with it certain ideas of strength. Hunting is an enormous part of the overall identity in the state of Michigan, earning some hefty real estate on the Pure Michigan website under the “Things to Do” section. Pride, bragging, and showmanship all play a part in how the in-group interacts with one another. The culture is largely family-based, as the practice requires teaching and active participation to master and make enjoyable – since if you can’t properly shoot a deer, you’re just standing out in the middle of the woods for nothing. Gun safety, basic skills, and common strategies are all passed down from generation to generation, with all of our participants being mentored specifically by their fathers or grandfathers, even if the matriarch of their family also partook in the sport. This deliberate enculturation typically starts just before or just after puberty, with this particular family mostly ranging from nine years old to thirteen years old. 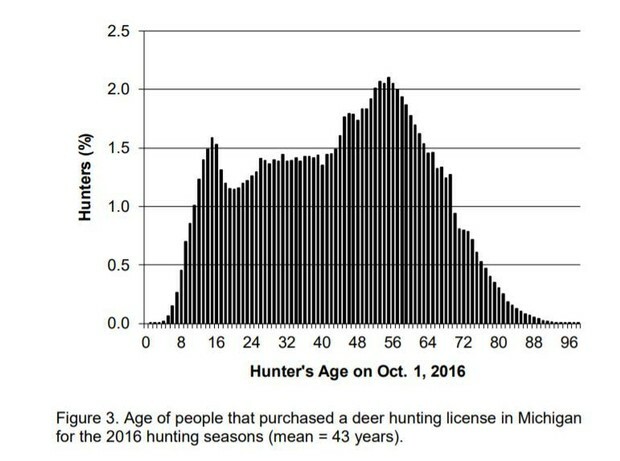 This is common for many, as shown in this graph from the Michigan Department of Natural Resources (Mack, 2017) – where the number of individuals applying forhunting in the 8-16 range is larger than that of the 16-24, showing that children are picking up their licenses for the first time and going out on the hunt around the pre-teen, early teen years. The only exception in our sample was found in Julia, who didn’t fully participate in the sport until the age of 30, despite the fact that both her father and mother hunted regularly. As evident by her father’s dismissal of the notion of hunting being “manly,” and her mother’s participation in the sport, this decision was almost entirely based on personal preference, rather than her upbringing or gender. In addition, you have some individuals who were being introduced to all aspects of hunting at a very young age. Grandpa H. and Sarah were with their elders, helping or just hanging around, from ages as young as 5. Catherine also was involved in the preparation of the meat as a very young child – her father and grandfather would bring home the carcass and everybody would pitch in to cut it up. This allowed the younglings to get interested in the world of hunting, and to possibly hear stories, learn tidbits of information, and just generally be involved in the hunting process before it was safe for them to hold a firearm. Many families in Michigan treat this event as a coming of age, and is a major stepping stone in the lives of a young man/woman. And, while Sarah made a big deal about making sure her first deer was the perfect deer, the Johnson family is very relaxed about the process. The see it more as something you “ought to be able to do,” as Grandpa H. put it. Thomas believes that some individuals take the practice “a lot more serious than it ‘oughta be, for what it is.” To him, it’s mostly for food, and while competition and sportsmanship play a big part in hunting, he sees it as a chance to relax outdoors, enjoy the peace, and watch the animals. 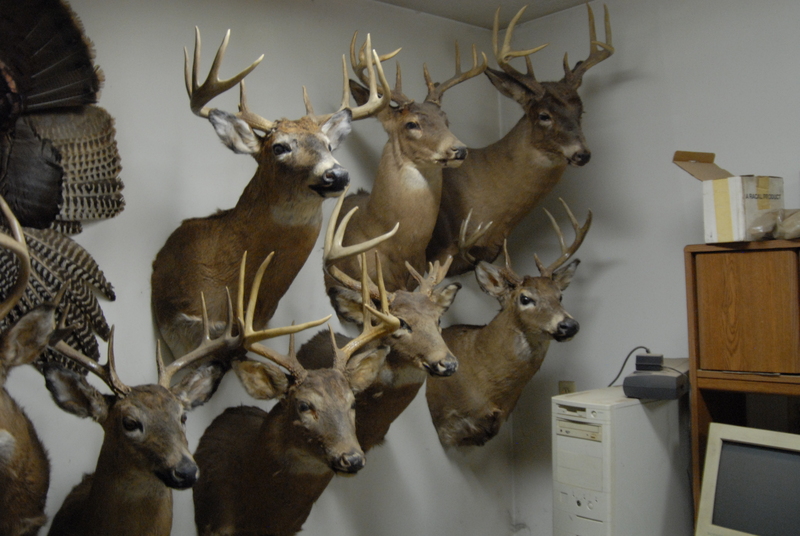 Deer mounts in the office of the family’s farm. Photo by Sarah Horton. Outside of the Johnson family, Thomas emphasizes that many who internalize hunting as a sport get quite a lot of it in the social aspects. He mentions that “some people go up to these cabins that they use once a year, with people they’ve been [hunting with] for many years, and it don’t matter if they come away with a buck or not, it’s about spending time with out there with their buddies.” Despite this, the Johnson family still does mount their deer, a craft that Grandpa H. does on his own, and displays them in their home and their workshop. They do participate in the hunting culture, outside of their close-knit family – even if their hunting is for food – with the occasional chit-chat of the sport; the bragging, the stories, and the discussion of strategy they tell friends and fellow hunters. Catherine uses her stories and expertise to connect with her students and make relationships with them easier, as they have common ground that eases the gap in age or gender. Julia and Thomas also mention shows and gathering that many Michigan hunters participate in. This is where the bragging and stories take a leap from friend to friend, to stranger to stranger. These events have all sorts of themed raffles, banquets, competitions, and are facilitators for these kind of hunting-related interactions and conversations. However, again, the Johnsons don’t particularly take it that seriously, as they just want the venison in the freezer, and anything else is extra. 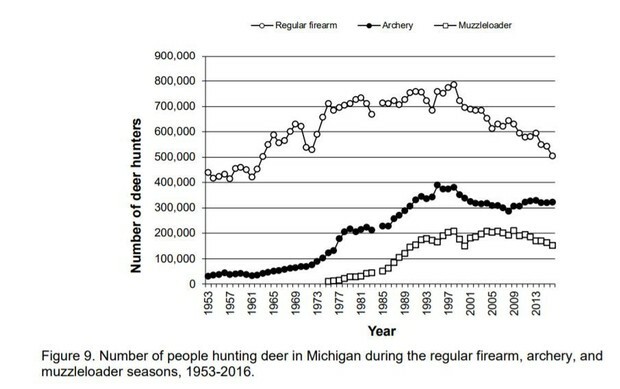 As seen in the graph, taken from the Michigan Department of Natural Resources (Mack, 2017), rifle hunting has been on a steady decline since the late 1990s, when it peached at almost 800,000 participants. 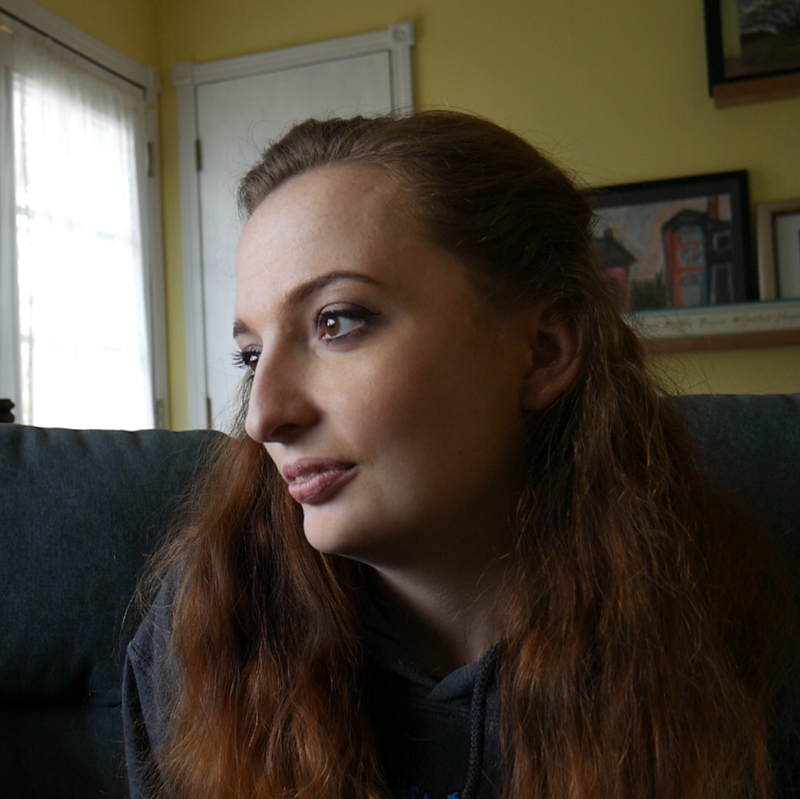 While the culture and number of hunters is still far and above most states, Sarah believes the growth of cities and suburbs (particularly in the expansion of new subdivisions) has dwindled the numbers of active hunters. One possible hypothesis, based on our interactions with our participants, is a generational “burnout” occurring. As we see in the young daughters of the Johnson family, Catherine and Sarah, the two of them differ in their stances on the future of hunting and passing down what was given to them by their parents. Catherine, who doesn’t really hunt anymore since moving out, doesn’t see herself personally taking the time to enculturate her future children. Perhaps she may take them to “hang out with Grandpa,” as she puts it, but it’s unlikely she’ll take it upon herself to take them out into the woods. Sarah, on the other hand, thinks it’s very important to learn gun safety at a young age, and she wants to take her children out into the wilderness to allow them to carry on the tradition of hunting. 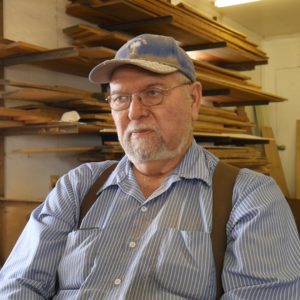 This divide is something not seen in previous generations, as both Thomas believes hunting to be deep seeded in tradition, “passed down from generation to generation,” and thinks its a valuable skill for anybody. However, he also believed if his children didn’t pick it up, that was alright. Grandpa H. and Julia also obviously saw value in indoctrinating their children, as they’ve already raised a few batches of adults who learned how to hunt. Hunting is a practice that bonds the Johnson family together. Over many generations, hunting has spanned divisions of age and gender and proved to be an activity that embodies kinship relations and family values. Through initiation and practice, family members are brought into a culture that prioritizes practical food-gathering strategies and sportsmanship. While age-old hunting narratives rely on the division between gender roles, the women within the Johnson family do not fit subservient female stereotypes and based on their stories neither were their female ancestors. It is safe to say that the polarized narrative of the subservient non-hunting woman and the dominating male hunter-hero is little more than a myth carried on through America’s history. We also found that although most modern families like the Johnsons no longer hunt strictly out of necessity, hunting continues to meet practical needs, acting as a food resource and a measure for preventing crop destruction. In addition to these practical components, hunting is also cherished as an individual activity with social elements. Exceptional catches often result in celebratory snapshots or shoulder mounts and a sense of accomplishment. Transporting the deer, processing the meat, and eating the venison are ways the Johnson family distribute labor and enjoy various aspects of the hunt collectively. Hunting is reflected in the broader culture of Michigan by way of hunting camps, banquets and competitions. Many hunters in mid-Michigan look forward to the hunting season as an exciting and competitive time of year. While the future of hunting and its legacy within the kinship system has yet to be seen, the Johnsons exemplify one mid-Michigan family that has attached values and relationships to hunting for decades. Devlin, Hannah. “Early Men and Women Were Equal, Say Scientists.” The Guardian, Guardian News and Media, 14 May 2015, www.theguardian.com/science/2015/may/14/early-men-women-equal-scientists. Duda, Mark Damian, Steven J. Bissell, and Kira C. Young. Factors related to hunting and fishing participation in the United States. Responsive Management, Western Association of Fish and Wildlife Agencies, 1993. Littlefield, John. Subculture of Deer Hunters and the Negotiation of Masculinity: An Ethnographic Investigation of Hunting in the Rural South, Virginia Tech, 2006, https://vtechworks.lib.vt.edu/bitstream/handle/10919/29695/Littlefield_ETD.pdf?sequence=1&isAllowed=y. Mack, Julie. “Michigan ranks No. 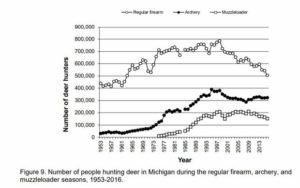 2 in 2016 deer harvest, and other deer-Hunting facts.” Mlive, 6 Nov. 2017, www.mlive.com/news/index.ssf/2017/11/michigan_deer_hunting_season_2.html. Boglioli, Marc. “Gender Transformations.” A Matter of Life and Death: Hunting in Contemporary Vermont, University of Massachusetts Press, Amherst; Boston, 2009, pp. 77–93. Hodges, John. “Animals and Values in Society.” Livestock Research for Rural Development, vol. 11, no. 3, 1999, www.lrrd.org/lrrd11/3/hod113.htm. Keen, Ian, and Takako Yamada. Identity and Gender in Hunting and Gathering Societies: Papers Presented at the Eighth International Conference on Hunting and Gathering Societies (chags 8), National Museum of Ethnology, October 1998. Osaka: National Museum of Ethnology, 2001. Print. Mogren, Eric. “Miss Billie’s Deer: Women in Bow Hunting Journals, 1920-1960.” Journal of Sport History, vol. 40, no. 2, 2013, pp. 215–239. JSTOR, JSTOR, www.jstor.org/stable/10.5406/jsporthistory.40.2.215.